The 1-808 is designed for the industrial environment where machine monitoring is important and space is at a premium. The 1-808 is designed for the industrial environment where machine monitoring is important and space is at a premium. Each 1-808 Vibration Transmitter includes a high-pass and low-pass filter and the transmitters are configured to the customer's specification at the CEC factory. 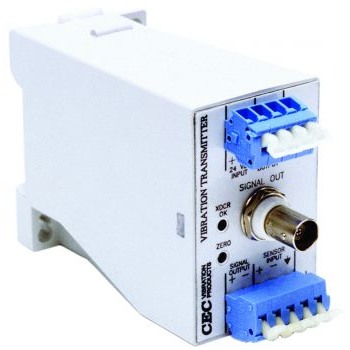 By providing a calibrated 4-20 mA output signal, the 1-808 Vibration Transmitter is ideal for use with PLCs, Dis's, remote displays, or other electronic systems.